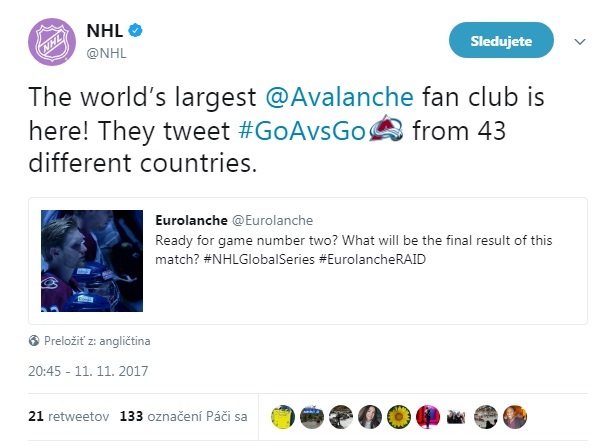 European fans will join up for Avalanche playoffs games watch parties. The Eurolanche Fan Club congratulates the Colorado Avalanche organization to clinching a spot in the Stanley Cup Playoffs for the second straight year. On this occasion, Eurolanche will organize playoffs watch parties for its members in Europe. Hoping to see 16 more Avalanche wins this season, the preliminary schedule includes four different cities in four different countries for each of the first four rounds at least. The watch parties would be organized in Bratislava (Slovakia), Brno (Czech Republic), Vienna (Austria) and Budapest (Hungary). Other host cities for said watch parties will be determined based on interest from Eurolanche members, who will be able to suggest and choose locations in the near future. An Avalanche playoffs run watch party is also scheduled for Eurolanche's trip to Normandy, France at the end of April.